As our launch date approaches and with the building’s structural work now complete, work has started on the creation of the Sandy Mount House interior. We are delighted to be working with renowned designer, Michelle Derbyshire, who is well known for her work in city centre Manchester venues including Australasia and award winning Grand Pacific. As an Australian, Michelle has an inbuilt love of coastal life. Inspired by the rugged, unspoilt coastline around Rhosneigr, she has created a smart yet relaxed ‘beach shack chic’ look for SMH – think time-worn leather and natural linen, sand-bleached wood, wicker and sisal, and a palette of blue and navy along with natural hues. Sandy Mount House has been designed very much as a year-round venue, and will include a covered, heated outdoor terrace for trans-seasonal dining as well as cosy open fires for the winter months – great spots to share a bottle of wine or savour an afternoon tea and catch up. 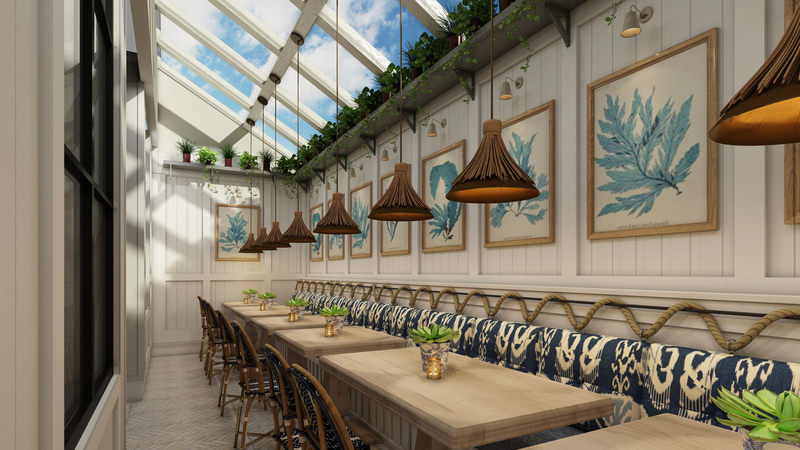 The building is being split into several areas for relaxed dining, and will include a roof lantern dining area where guests will be able to see chefs at work in an open kitchen. There are also two rooms suitable for private dining – the ideal setting for a special event or perhaps a business dinner. The feeling of relaxed luxury will continue throughout the seven guest bedrooms, with thoughtful features such as interconnecting family rooms helping to create a real home away from home. We’re looking forward to welcoming you to our beach house soon.